Flaky, white, infused with lemon and a touch of thyme, pan-seared cod with its golden exterior is a dish to daydream about. And maybe, in the not too distant future, merely to dream about — for cod, once an abundantly plentiful fish, has been on and off the endangered species list for more than a decade. Within our lifetimes it may well disappear completely in markets from Paris and Lisbon to New York. If it’s available these days, it can be pricey. But it’s worth it, in my opinion. Instead of debating the ethical issues of eating cod in the 21st century (issues of which there are plenty, but we have the comment space on this page for that), I’d like to bring you up to date with some site news. Today marks once month since I launched The Everyday French Chef as an experiment, not knowing what would ensue. The result so far has surpassed my hopes. Yesterday, we had our 2,000th page view — a milestone that felt particularly well timed! As of today, I’ve begun building up the Menus section of the site with suggestions for quick seasonal everyday meals — cooking time of 20-30 minutes — composed of dishes that have already appeared on this site. Coming soon: Menus for weekends and special occasions. If you have been enjoying the site, please don’t hesitate to subscribe by clicking on the little envelope at the top of the page. This will bring a daily email update to your inbox informing you of the recipe of the day. And please feel free to share these recipes with your friends. Many thanks for your support! This entry was posted in 5. 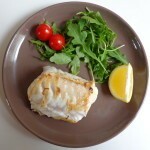 Fish and Shellfish and tagged cod, pan-seared cod, pave de cabillaud, recipes. Bookmark the permalink. Made this last night! I used fresh thyme from my garden and halibut because I couldn’t find cod–and lengthened the cooking times just by a minute or two because the fish was thicker. It was wonderful–and easy. I do love these daily recipes…and appreciate the “go with” suggestions. Jan, thanks for the feedback! It’s great to hear about it when a recipe turns out well — and your innovations sound delicious.